Gary Schroeder is the global director of Cooper Tire’s Truck and Bus Tire Business. Maintaining proper inflation pressure in tires is the single most important factor in extending tire life. Both overinflation and underinflation have a negative impact on the tire’s footprint and tread wear. When the tire is not contacting the road as the tire design intended, the tread area will wear irregularly, and therefore, more rapidly. Underinflation causes excessive heat build-up and potentially internal structural damage, whereas overinflation makes it more likely for tires to be cut, punctured or damaged by sudden impact. In addition, tire rolling resistance and fuel economy are also affected by inflation pressure. Low inflation pressure will increase rolling resistance and fuel consumption. Correct tire inflation pressure is determined by the load carried for each tire. The target inflation pressure should be determined by considering the actual weight per axle and using a load/inflation table. Mismatched tire inflation on dual assemblies is typically an important contributor to faster tire wear because the two tires are a different circumference with as little as a five PSI difference in inflation. Checking tires with an air pressure gauge is important as a tire may be low on air, but it may not be obvious yet. 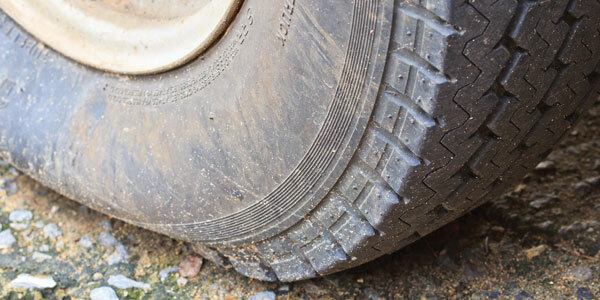 If a tire continues to need air on a regular basis, it is likely a sign of a slow leak from a puncture or other problem. It can be hard to determine the source of a slow leak, so be sure that the bead is not damaged and is properly seated on the wheel. Also, check that the valve is not leaking. It is hard to see inside dual tires, so checking them with a pressure gauge is recommended. If an inspection shows that a tire is 20% underinflated or more, then the tire should be considered flat and immediately removed from service. The tire must be demounted and inspected by a qualified technician to look for casing damage. It is recommended that fleets implement a comprehensive maintenance program that includes regular inspections to check for proper tire pressure, tread depth and irregular wear. Properly maintained, serviced and inflated tires last longer, so fleets get the most from their tires. One of the simplest things drivers can do is to inspect their tires prior to each trip. Consider using fleet management software to track tire wear. This can help identify any abnormal wear situations and facilitate timely removal of worn tires. Using tire pressure monitoring systems (TPMS) on trucks and continuous tire inflation systems (CTIS) on trailers in order to simplify and improve tire pressure maintenance will quickly alert you to problems. Improved tire pressure maintenance will help improve fuel economy and tire wear. Even if you are using a CTIS, you still need to check your inflation pressure on a regular basis. Don’t assume the tire inflation is perfect, especially if you have mismatched dual assemblies. Cooper recommends checking tire condition and pressure on a weekly basis before each trip and daily during continuous service.